[FTC Standard Disclaimer] We are proud to be sponsored by Certified Angus Beef and received the Cattleman's package free of charge. We also received the Dizzy Pig IPA Seasoning as a free sample. Early fall is a perfect time of year for grilling in the evenings. For starters, it's comfortably warm, not offensively hot. Also, It hasn't started getting too dark, too early yet. The chorus of cicadas and katydids is nature's soundtrack. We took full advantage of this and grilled up a magnificent surf and turf last night. The "surf" was lobster tails seasoned with IPA compound butter. The "turf" was Certified Angus Beef ribeye steaks crowned with a Gorgonzola-Black Pepper compound butter. 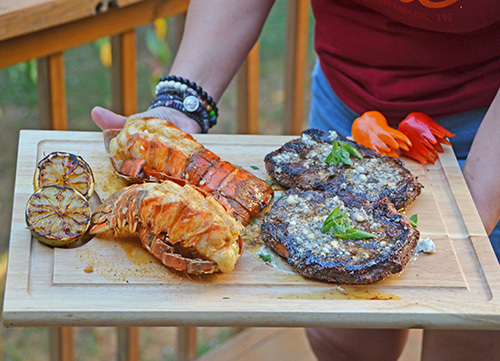 This is more of an idea post than a recipe post, so here's what I did with the steak and lobster tails. Made the butter by mixing together 1 stick of softened unsalted butter, 1/4 cup of crumbled Gorgonzola cheese, 1 teaspoon of 16 mesh black pepper, and 1/2 teaspoon of Hawaiian red clay salt. I left it out at room temp because I wanted to keep it soft and easy to melt. Tempered the steak by leaving it out at room temperature for a little over an hour. Preheated a kamado grill with natural hardwood lump charcoal to 500°f. Seasoned the steaks. Just before grilling, I patted them dry, put a light coat of high temp cooking oil and seasoned them with my Umami Steak Seasoning recipe. Grilled the steaks at 500°f for 4 minutes a side. [FTC Standard Disclaimer] This post is sponsored by Smithfield and their line of Fresh Marinated Fresh Pork. This fusion sub sandwich is ideal for game day menus. 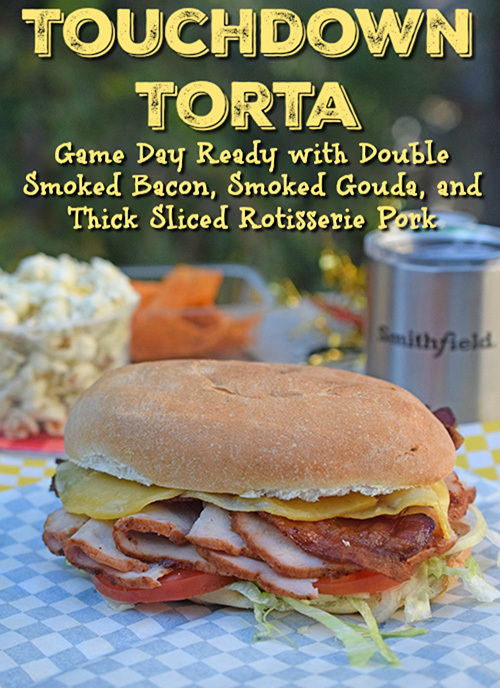 Loaded with double smoked bacon, smoked Gouda cheese, and thick sliced roasted pork on a crusty and light bolillo roll, you won't walk away hungry. 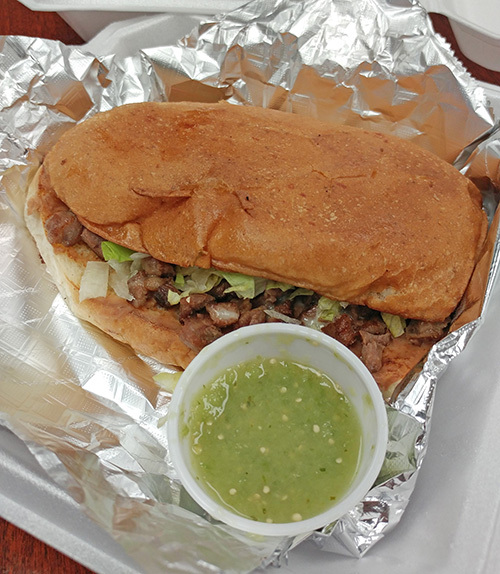 This huge sandwich is based on the torta, a Mexican sandwich served on a crusty roll. Tortas are usually large and stuffed with pork, chicken, or beef. They are finished in a sandwich press and then served warm. We get tortas frequently from a little unnamed food truck near our office and came up with this idea when I noticed the bolillo roll resembles a football. Torta from a local food truck. We put our own spin on the torta by adding the red pepper mayo, bacon, and Gouda cheese, so it's not a traditional torta. Then we made it quick and easy by using Smithfield's Fresh Marinated Pork Golden Rotisserie Flavor Sirloin. Hardwood Smoked Bacon and Cracked Black Pepper. If you have the space on your grill, you can cook bacon and pork at the same time to save time. 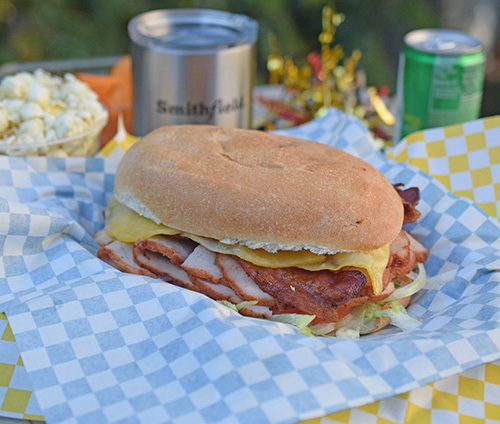 Or you can just pre-cook the bacon and pork sirloin and then just put the sandwich together and warm it up at the tailgate. If you like, you can just use a panini press for the last part. Give this big sandwich a try. It is so good and ideal for tailgates, it doesn't matter if you are watching football or fùtbol. This dish was inspired by a breakfast that Alexis and I had a few weeks ago at First Watch in the Bearden district of Knoxville. 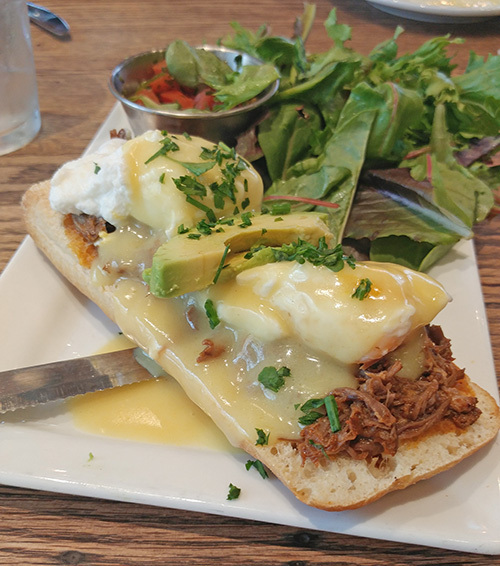 Their Barbacoa Benedict was a summer special menu item that had braised barbacoa, 2 poached eggs, Hollandaise sauce, and sliced avocado on a ciabatta roll. Although I was inspired by First Watch's Barbacoa Benedict, I didn't want to just copycat it - I wanted to riff off of it. Beef - Our waitress didn't know if their barbacoa was beef cheek or brisket but whichever, it was braised. I used smoked brisket for my protein. Saucy - Although Hollandaise is traditional for Benedict, I borrowed a page from Croque Madame or Kentucky Hot Browns and used a Mornay sauce. Extras - I wanted to kick up the flavors a bit with fire roasted tomatoes and Hatch green chiles. 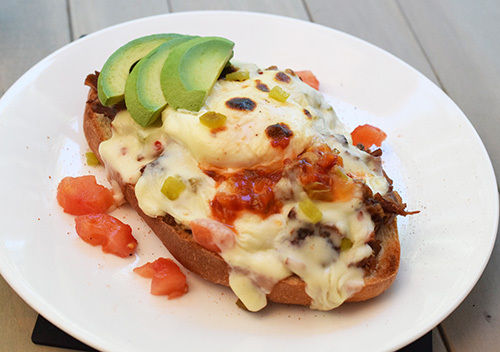 My Tex-Mex Brisket Benedict was a wee bit different. [FTC Standard Disclaimer] I am sponsored by Char-Broil but this is not a sponsored post. Sometimes I don't plan out my meals too well. 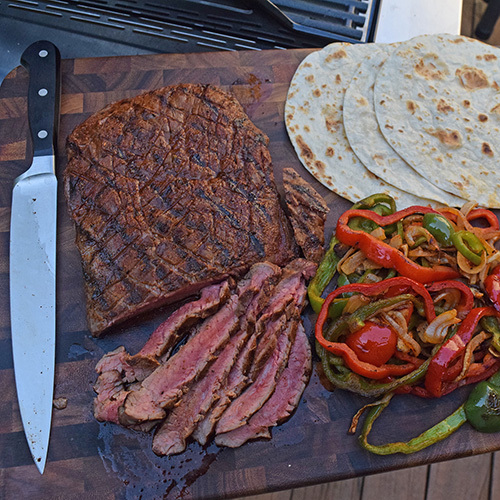 This was the case earlier this Summer when I had a flank steak and was craving fajitas. I didn't have a long time for a marinade so I did a few things to work around that. Boosted the acid in the marinade - Normally I do about 2-3 parts of oil to 1 part of acid but for shorter marinade times, I up that ratio to 1.5 parts oil to 1 part acid. In this case, the acid was lime juice. Increased the seasoning - Since the fajita seasoning wasn't going to have time to absorb into the meat much at all, I increased the seasoning by 50% to make it bolder. This doesn't get any more flavor in faster, it just means a little more will cling to the meat. Scored the meat - I scored the meat a little deeper than I normally do. I put a little more pressure when dragging a sharp knife across the raw flank steak, which opens more surface area up to the marinade. 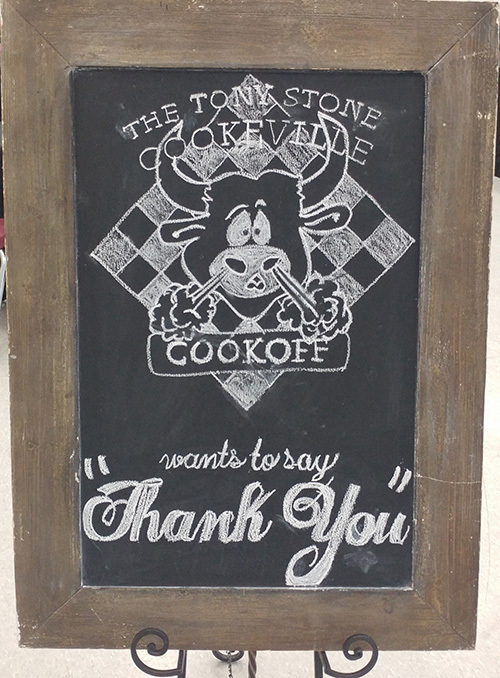 This weekend was the 27th and final running of the Tony Stone BBQ Cook-off in Cookeville, Tennessee. 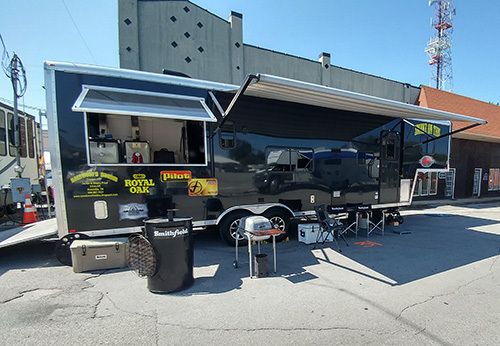 This cook-off is a professional BBQ contest sanctioned by the Kansas City BBQ Society and it is held at the same time as the idyllic town's Fall FunFest. Last year, we registered for the contest but couldn't attend. Mick Chessor agreed to compete in our place in 2016 as long as Alexis and I competed with him this year. I just had two heart procedures ten days before this contest and was on limited duty, but I wasn't going to miss the final year of the Tony Stone BBQ Cook-off. Alexis and Mick just did all of the "heavy lifting"
I didn't take my camera but here are some phone pictures from the event. The cook-off was well organized and I hate to see it go, but I understand how difficult it is to maintain such an event over so many years. 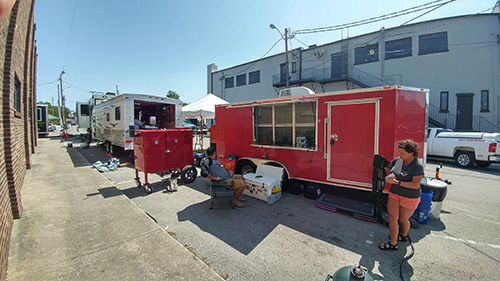 This was our first contest using a Deep South Smokers insulated box smoker instead of kamado grills (Big Green Egg, Grilla Kong, Grill Dome, Primo, etc.). Not having to break down and move four 200-lb kamado grills was so much easier and faster. 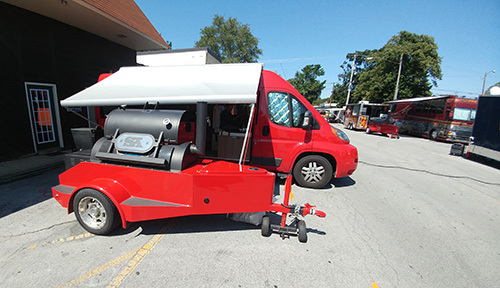 But with all that red, I might have to buy a Kamado Joe to have on the trailer. Jackie and Sherry Price's rig for their team, Smoke on This. They are seasoned pros and win more than their share of these contests. He uses Backwoods cookers (see them through the window), a drum smoker, and a PK Grill. A nice Yoder Smokers pull behind pellet smoker.